Most of us grew up with our parents or grandparents reminding us to keep our elbows off of the dinner table. Although this was a lesson in manners, some children have a hard time refraining from leaning on the table due to difficulty holding themselves up against gravity. Does your child have a hard time standing or sitting still? Does your child prefer to lean or lay their head down while playing or when sitting at a table? Does your child fall out of the chair at school or meal-time? If your child is playing on the floor, do they prefer to sit in ‘W’ position and/or lay down? Does your child prefer to watch tv or play video games vs. play outside or go to the park? To build up posture against gravity and ensure that balance is maintained. To position the body or body segments appropriately with respect to the activity. A mature and well-functioning postural control system is important because it allows other muscles of the body to release from “fixing” patterns and function for what they are designed for. 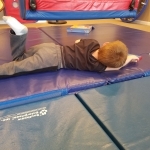 For example, having sufficient postural strength, endurance, and control allows for improved breath support for speech and also for stability at trunk and freedom of movement at arms and hands to allow for writing activities. If you have concerns for your child in this area and are tired of hearing yourself remind them to remain upright, they may need a little help. Physical therapy can be beneficial for strengthening and coordinating muscles for posture and head/body positioning and increasing awareness and control of the body for stationary and dynamic activities.